Sambhariyu Shaak is a traditional Gujarati stuffed vegetable dish. 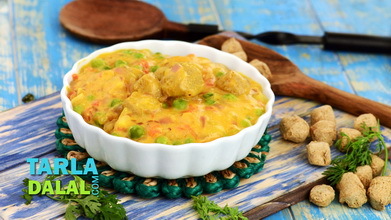 This dish can be customised to your liking by using any vegetables that you and your family prefer. However, the vegetables are to be selected carefully to make sure they look good and get cooked evenly. Pressure cooking is the easiest method to make this recipe as it uses less oil, takes less time and cooks evenly. Make sure you add the besan in the filling to make the veggies dry. Remove the ends of the tendli and the brinjals stalks. Make a vertical slit to the tendli and criss-cross slits to the brinjals. Stuff the tendli and brinjals with a little stuffing. Combine the stuffed tendli, stuffed brinjal, sweet potatoes, baby potatoes and the remaining stuffing in a deep bowl, mix well and keep aside. Heat the oil in a pressure cooker; add the asafoetida and sauté on a medium flame for a few seconds. Add the vegetable mixture and ¼ cup of water, mix well and pressure cook for 2 whistles.